Ukrainian ex-military navigator Savchenko sentenced to 22 years in prison | Russian Legal Information Agency (RAPSI). Donetsk (Rostov region), March 23 (RAPSI) – A six months trial of Ukrainian retired officer Nadezhda Savchenko, 34, ended today. She was found guilty of murder and illegal border crossing. The court of Donetsk, a town in southern Russia, has sentenced Savchenko to 22 years in prison. She was also fined 30,000 rubles ($428) for illegal border crossing. A day earlier the judge, Leonid Stepanenko, said Savchenko had “deliberately inflicted death on two persons, acting according to a conspiracy and motivated by hatred and enmity”. 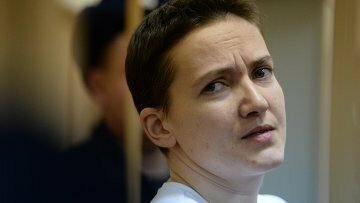 The court found out that Savchenko committed the crimes on grounds of hatred for the Russian-speaking people with her guilt confirmed during the trial by the testimony of several witnesses. As the court has established, she was responsible for conducting concealed observation and directing mortar fire in an attack against a roadblock held by militias of the self-proclaimed Lugansk People’s Republic and a group of civilians there, including three Russian journalists, near the village of Metallist, the Lugansk Region, on June 17, 2014. The attack killed two Russian television journalists, Igor Kornelyuk and Anton Voloshin. Savchenko, who at that time was on active duty in the Ukrainian Armed Forces as a navigator and systems operator of a Mi-24 attack helicopter, enlisted and served on the ground with a volunteer paramilitary unit, the Aidar Battalion, while being on leave. On the same day, she was captured by members of the Donbass People’s Militia; however, she managed to escape. Charges of firing at civilians in the city of Lugansk have been dropped against Savchenko because this issue is out of a Russian court’s jurisdiction. Savchenko was arrested in Voronezh, a town in the Russian territory, in July of 2014. The prosecution insisted that Savchenko had been arrested after crossing the border disguised as a refugee in order to plot attacks, what made her a common criminal, not a prisoner of war. Savchenko claimed that she was abducted from Ukrainian territory and that her seizure had happened one hour before the deaths of the journalists. During her detention and trial, Savchenko has repeatedly gone on hunger strikes protesting against her arrest and trial. The ex-navigator pleaded not guilty stating that she had killed people, but only those she considered to be enemies and in self-defense, never with malicious intent. Savchenko refused to recognize the judgement. "Savchenko is not interested in this verdict, she considers it a kangaroo court. She has just told me that she does not recognize it, whatever it is, she will not appeal it," lawyer Nikolay Polozov told RAPSI. Savchenko has ridiculed the court from the defendant’s cage and flashed her middle finger at the judges earlier this month as her trial ended. The Savchenko case has become a matter of great controversy and attracted much international attention. It has been commented on by President Putin, President Obama, and President Poroshenko, alongside with other state officials and NGO leaders. An international campaign demanding to free Savchenko has been underway since the beginning of her detention. However, Russia insists that these demands are an attempt to influence its judiciary system. For instance, Dmitry Peskov, Vladimir Putin’s press secretary, has said citing the Russian president words that “we are talking about a court process and any interference with the work of our courts is inadmissible,” as the RT news agency reports. Nadezhda Savchenko, born in Kiev, on May 11, 1981, is a retired officer (senior lieutenant) of the Ukrainian armed forces, a member of the Verkhovna Rada (the Ukrainian parliament) and the Parliamentary Assembly of the Council of Europe in absentia. 16:40 22/03/2016 A six months trial of Ukrainian retired officer Nadezhda Savchenko, 34, ended today. She was found guilty of murder and illegal border crossing. The court of Donetsk, a town in southern Russia, has sentenced Savchenko to 22 years.